Are Tony Stewart’s Sprint Car Racing Days Over? Probably not, if Stewart has any say in the matter. But perhaps the decision won’t be his to make. 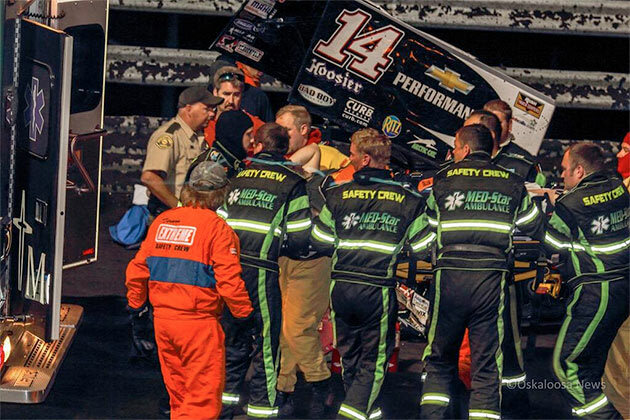 Stewart, 38, suffered a compound fracture of both bones in his right leg Aug. 5 in a sprint car crash at an Iowa bullring. It was his third death-defying sprint car crash in less than a month, but the first one he couldn’t walk away from. A month earlier, he had spoken at the funeral of his friend Jason Leffler, who had just been killed sprint car racing – like at least a half dozen other drivers in a variety of sprint car events around the nation in the previous year. When reporters tried to question Stewart about sprint cars, Aug. 4, he had chastised them for exaggerating the dangers. Stewart’s admonishment seemed rather short-sighted, if not downright silly, 24 hours later. Rosy initial reports raised optimism that Stewart, a three-time Nascar Sprint Cup champion, could be back behind the wheel in a matter of a few weeks. But orthopedic surgeons said a minimum recovery time of four to five months was more realistic. Ironically, one of Stewart’s racing heroes, A. J. Foyt, had his career cut short by serious leg injuries suffered at a 1990 Elkhart Lake race (the entire race broadcast has been posted on YouTube; Foyt’s crash is at 40:18; http://www.youtube.com/watch?v=a4evYMgB0Oo). Although Foyt, the ultimate tough guy, did manage to race again (many months later) his career and, arguably, his business never were the same. The annals of racing are filled with stories of tough guys like Foyt coming back from horrific injuries. No doubt Stewart figures he’s as tough as anybody who ever strapped into a race car. “It doesn’t really matter how tough you are,” said sports car racing champion Hurley Haywood, who broke both bones in his left leg in a 1983 crash in Canada. His foot slipped off the clutch, and went down in between the pedals; the crash impact crunched the pedals together. Ouch. “When you break both bones like that, the recovery time is much longer because there’s isn’t one unbroken bone to stabilize the other. It is very tricky to get both bones stabilized completely, so they can heal properly,” he added. Despite expert care, the bones in Haywood’s left ankle never healed properly. It was many months until he could race again, and for two years thereafter he still couldn’t depress a clutch pedal; his car had to have an automatic transmission. Some 30 years later, Haywood still walks with pain and a distinct limp. Leg injuries suffered in racing crashes also had serious consequences for the careers of Indianapolis 500 winners Gordon Johncock, Johnny Rutherford and Rick Mears, among many others. Many of these drivers Stewart, a native of Columbus, Ind., who grew up dreaming of winning Indy, idolized as much as he did Foyt. But another of Stewart’s idols, Roger Penske, followed a much different path. Early in his career Penske was a very successful racing driver; he won a national championship, top drivers honors and many races. But he turned down a chance to race at Indy (his ride was instead offered to another rookie, Mario Andretti), and he retired as an active driver. Though Penske never raced again, the fact that his business enterprises grew and prospered enough to make him a billionaire is some consolation. And that is the conundrum Stewart faces. Though he wants to be known as a brave racer of anything, anytime, anywhere, Stewart also fancies himself a businessman. He owns, or co-owns his own racing team, which employs more than 300 people. He owns a race track, and a number of other enterprises. He has obligations to sponsors, marketers and merchandisers; his backers don’t feel they get the same value for money when Max Papis races his car while Stewart is strapped instead into a hospital bed. He has a lot of responsibilities. A lot of obligations. And a lot of mouths to feed. For the first time in his largely injury-free career heretofore, he has a lot of time to think about how he is going to prioritize his life’s ambitions, needs and goals. He’s been unbelievably lucky, beating the odds that have sidelined his idols, so far. If you don’t believe me, do a Google image or YouTube video search for “Tony Stewart crash”. « Whatever Happened To The ‘Fast Five’ Pantera? Too bad for the good Tony, he is going to miss the next Nascar race which is one of th most challenging of the season: Watkins Glen. Tony Stewart is one of the ultimate mighty racer along with Robby Gordon and Kimi Raikkonen. Few years ago he used to be present at 2 races in one day playing with the time zones. Good luck for Tony get well soon !